You want the design approach to be as simple as possible, meaning less busy visually. The busier in appearance the bathroom is, the smaller it’s going to feel. You want to keep patterns to a minimum, keep colors choices toned down, create long, simplified lines and not over accessorize. Wall treatment discussion: “Will mirroring my bathroom walls help my space feel bigger? Should I wallpaper or add an accent painted wall? Going along these lines, some people believe, falsely, that mirroring your walls in the bathroom will make the space feel bigger. 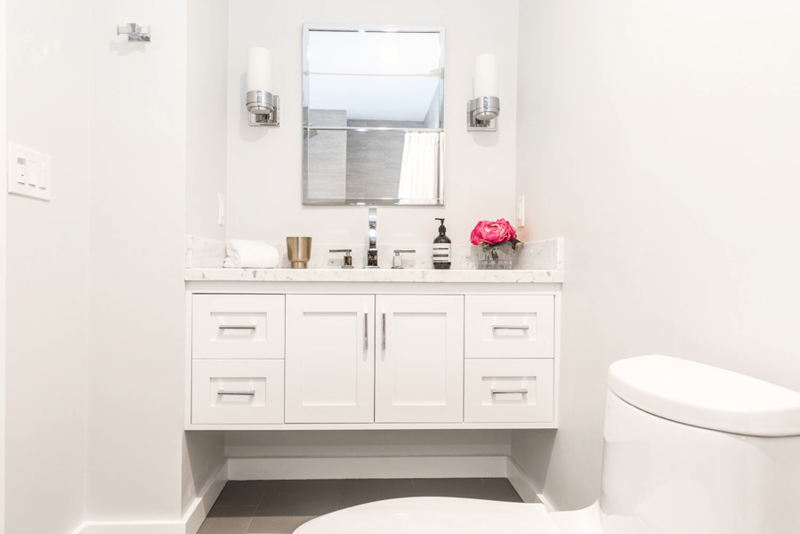 But what you’re actually doing by mirroring the walls, is you’re replicating all the details of the bathroom over and over, which contributes to the overall busyness vs. if you just painted the walls and had an appropriately sized mirror above the vanity. Also, keeping paint color consistent and in lighter tones throughout the room ,and even ceiling color the same (depending on wall color choice), will create the illusion of a larger space with no contrasting paint color or wallpaper detail to stop your eye. Focus on cabinets that are either wall hung or furniture style cabinets that on the legs so that your eyes are drawn underneath the vanity so that you see more continuous floor space. The final thing that you want to avoid in trying to make a room feel bigger, is large cabinets and wall-hung features that are at or above eye level. 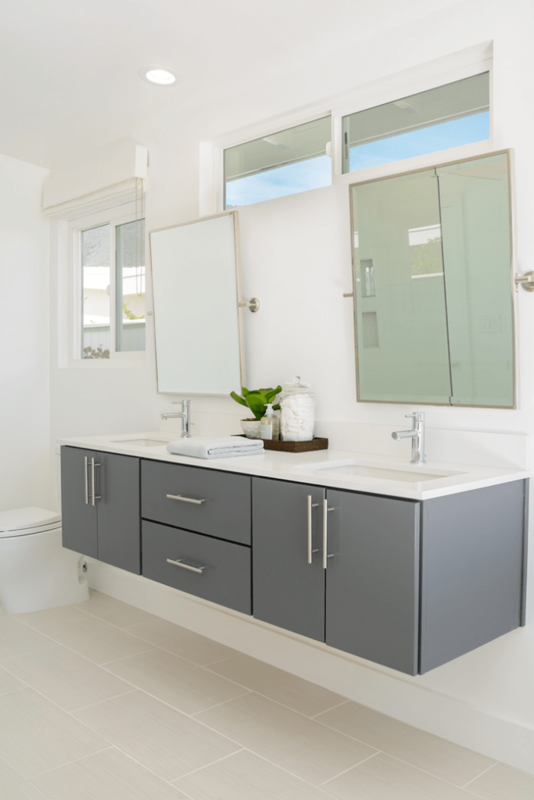 Things to avoid would be cabinets above the toilet, wide and/or tall linen cabinets, medicine cabinets that are surface mounted vs. recessed into the wall. These are some examples of design elements that are going to make the bathroom feel smaller. Keep it simple. Don’t busy it up. Wall treatment – Keep uniform and in light colors. Consider using vanity cabinets with space underneath them. Keep cabinetry & big, bulky items to a minimum and don’t hang items with too much depth on the walls at or above eye level. 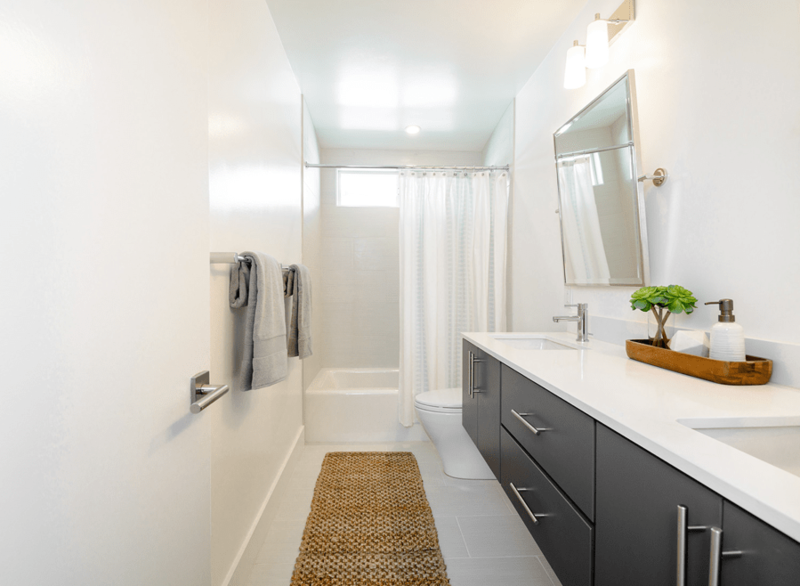 Call us today at 800-ONE-WEEK and we’d be happy to discuss how we can help remodel your bath into a calming, serene space that you’ll enjoy for many years to come!